To satisfy these small jobs I've built up a kit bag around a Panasonic DMC-GH4, a couple of lenses, a RODE NTG2, Tascam DR-70D, and a couple of lights. I also use a Minima 30 which is great little LED light that allows me to quickly match the ambient lighting and throw a bit extra in without upsetting the colour balance, I can add a radio Mic if necessary and always carry a couple of wired lavalier mics... These have saved the day on more than one occasion! I was considering a tripod upgrade since my rig is getting a bit heavier and I was given the opportunity to use the Libec TH-X for a day filming at a conference in central London. I travelled by train to the venue so I was pleased the tripod was relatively light and easily disappeared into a flight case, still in the supplied soft bag which has a useful zipped pocket. Good for stuffing a couple of allen keys, screws, adaptors and so on. On this occasion, I was shooting computer workshops in small conference rooms where there wasn't much space. The small footprint of the tripod was welcome in these conditions, however it's worth highlighting that if I was shooting outside in the wind it may not be so welcome. I certainly wouldn't leave my camera mounted and unattended. Of course, this is going to be a limitation of a mid-level spreader with no adjustment to speak of but there wasn't any fiddling about and it stays clean! The tripod opens smoothly and I liked the clever circlip catch on the spreader which stops the legs opening accidentally when the tripod is closed and it was particularly fast and easy to get everything level as the catches on the legs were easy to open and needed only half a turn between fully open and locked. 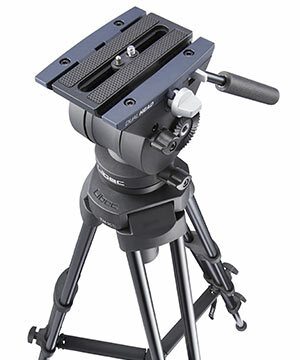 With my equipment, the head was stable as you would expect for this level of tripod and smooth pans were possible. Finally, the quick release plate on the head was genuinely useful (which incidentally is compatible with Manfrotto and Sachtler plates.) As well as being truly quick release I was confident everything would stay in place when it was locked. I had my GH4, Video Devices Pix-E with batteries, a RODE NTG2 and a Tascam DR-70D all in a cage on top of the tripod. Quite a lot of kit for a tripod at this level and it coped well. It was a successful day filming and 245GBP is a fair price for what turned out to be a stable platform. It will satisfy my needs for a while.